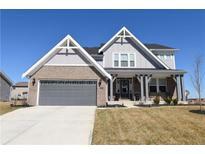 Below you can view all the homes for sale in the Villages At Brookside subdivision located in McCordsville Indiana. Listings in Villages At Brookside are updated daily from data we receive from the Indianapolis multiple listing service. To learn more about any of these homes or to receive custom notifications when a new property is listed for sale in Villages At Brookside, give us a call at 317-987-2530. NBRHD amenities incld miles of nature trails, pool w/poolside gazebo, playground, walking distance to Hancock Wellness center & future McCordsville Town center. MLS#21631499. CENTURY 21 Scheetz. This better than new and fully updated Fischer Home Blair Coastal Classic Model will have you feeling like a queen/king in your new castle! Come see it! MLS#21628950. Keller Williams Zionsville. Centrally located hall bathroom and large loft. Expanded 2 bay garage. MLS#21628524. HMS Real Estate, LLC. Upstairs you will find the 3rd bedroom with a full bathroom and HUGE loft. 2 bay side load garage. MLS#21627319. HMS Real Estate, LLC. Easy access to I69 and I70! MLS#21626844. Keller Williams Indy Metro NE. Top floor with 3 additional bedrooms that share a hall bathroom. Basement and 2 bay garage. MLS#21626508. HMS Real Estate, LLC. Top floor has 3 additional bedrooms that share a centrally located hall bathroom. Basement and 2 bay garage. MLS#21619762. HMS Real Estate, LLC. Expanded 2 bay garage with opener and keyless entry system. MLS#21619745. HMS Real Estate, LLC. Upgrades include: Stainless Steel vent hood, cement board siding, better carpet & pad in bedrooms, gas oven/range, water softener hook up, upgraded kitchen & bath cabinets, added large concrete patio, huge island with accent color cabinets, 9' ceilings, garage door opener with keyless entry, upgraded HVAC system, added more insulation to exterior walls and attic, upgraded doors and hardware, upgraded trim, added ceiling fan prewires, upgraded master shower. MLS#21617505. F.C. Tucker Company. Gorgeous new Foster Pacific Craftsman in beautiful Villages at Brookside featuring all the quality and craftsmanship you've come to expect from Fischer Homes. MLS#21617221. HMS Real Estate, LLC. Beautiful Turner Coastal Classic plan in the wonderful community of Villages at Brookside featuring all the quality and craftsmanship you've come to expect from Fischer Homes. MLS#21617210. HMS Real Estate, LLC. Stylish new Wilmington American Classic in beautiful Villages at Brookside featuring all the quality and craftsmanship you've come to expect from Fischer Homes. MLS#21617023. HMS Real Estate, LLC. Beautiful new Redfield Bucks County Retreat plan in the community of Villages at Brookside featuring all the quality and craftsmanship you've come to expect from Fischer Homes. MLS#21616862. HMS Real Estate, LLC. Outstanding new Sullivan American Classic plan in beautiful Villages at Brookside featuring all the quality and craftsmanship you've come to expect from Fischer Homes. MLS#21616856. HMS Real Estate, LLC.